Have you ever been somewhere familiar and felt like you were seeing it for the first time? What about when you see someone that you know but they are in a different setting? It’s difficult to recognize them at first. I try to go to the grocery store incognito, wearing a different costume than the one I wear at the university. But every now and then someone picks me out and recognizes me. We look at one another and are uncertain at first. Our brains are trying in a split second to put each other in this new context. 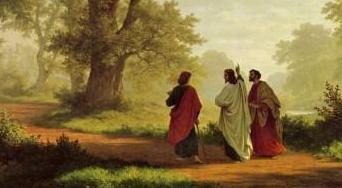 These two disciples had been following Jesus during his ministry, one may even have been there at his death. Yet they couldn’t recognize him. He was a stranger to them now. Who really knows why? Maybe it was because they had built a preconception in their minds of who Jesus was supposed to be, what kind of savior he was meant to become, what role he was to fulfill. Maybe they, like so many others, had built him into an idol. Then something went wrong. Their savior was powerless at the hands of the Romans, suffered torment and was executed. Now it was all over with. Then this stranger came along and started to explain things in a different way. He was a stranger to them because their expectations weren’t big enough for what God was actually planning to do. In the end, my own disappointment and discouragement with God’s plan always ends up coming home to rest at the smallness of my own faith. A faith that is too little for the greatness of God’s mercy, love and providence. He and his works are a stranger to me because I expect so little.